Enhance your garden or yard at night better with outdoor landscape lighting. It provides an ambient effect to trees, shrubs and flowers. Landscape lighting also has a practical side. Outdoor lighting is great way to mark pathways or accent garden areas. Get full use out of your garden, yard and patio areas by adding decorative landscape lighting to your outdoor spaces. Landscaped lighting provides an increase in safety, security, show cases the beautiful landscaped yard at night and provides ambience. 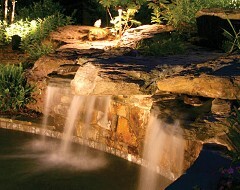 Landscape lighting allows you to enjoy your beautiful landscape and gardens at nighttime. At G & H Electrical Contractors and Consultants, Inc., we want you to love your landscape with well-lit landscape lighting. Our Douglasville landscape lighting experts are focused on getting the job done right the 1st time. The job is not done until you are 100% satisfied. We provide excellent customer service and striving to provide the best communication throughout your entire lighting control solutions project. Call G & H Electrical Contractors and Consultants, Inc. today for all of your landscape lighting needs.